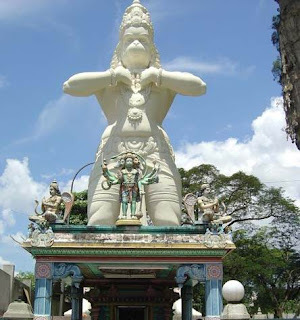 Batu Caves Murugan Temple, one of the most famous tourist spots in Malaysia, is located in Gombak district, 13 km north of Kuala Lumpur, in Malaysia. A limestone hill, Batu Caves has a sequence of caves and cave temples. The name is derived from the Sungai Batu or Batu River, which flows near the hill. Discovered in 1892, the Batu Caves consists of three main caves and few smaller caves. The biggest cave is called as Cathedral Cave or Temple Cave and has a 100 m high ceiling. Visitors have to climb about 272 steps to reach it. Batumalai Sri Subramaniar Swamy Devasthanam, also known as Batu Caves Temple in Malaysia, is a noteworthy religious site for Hindus across the world. Dedicated to Lord Muruga (Lord Subramanya), the temple is around 113 years old and is enshrined in one of the caves here. The temple cave stands about 400 feet above ground level, in a hill known as Bukit Batu, a Rocky Hill. The statue of Lord Muruga, found at the entrance of the steps, stands at 130 feet tall which is considered as the tallest statue of Lord Muruga in the world. This massive statue is a master piece of Indian sculptors. There are three caves at the base of the hill, known as the Valluvar Kottam, Art Gallery Caves and the Ramayana Cave. The walls of Vallurvar Kottam cave are covered with exhibits, murals and inscriptions of the poet, Thriruvalluvar. The Ramayana Cave portrays the story of Lord Rama. A 50 foot tall idol of Lord Hanuman is found on the way to the Ramayana Cave. The Dark Cave is seen below the Temple Cave. Cave formations and various species of fauna are flourished in this cave. Trips can be arranged only through Malaysian Nature Society. Temple Cave is opened from 8.00 pm – 9.00 pm. Best time to visit is from 8.00 am – 12.30 am and from 4.00 pm – 6.00 pm. Batu Caves is situated in Gombak district, 13 km north of Kuala Lumpur, in Malaysia. Batu Caves can be reached through Jalan Kuching and Middle Ring Highway. Batu Caves tourists can take a taxi or public bus from Golden Triangle. 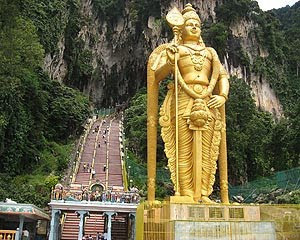 It will took around 45 minutes journey to reach Batu Caves Murugan Temple. Tourists can also use local buses from the Pudu Raya Bus Terminal in Kuala Lumpur to Batu Caves. Kuala Lumpur International Airport is the nearest airport to reach Batu Caves. Almost all major airlines operate flights to and from here including Hong Kong, Bangkok, and Indonesia. There are currently no heavy-rail trains running to the district; however Batu Caves Train Station or Batu Caves Railway Station is expected to be developed soon. There are numerous hotels in Kuala Lumpur, ranging from budget hotels to 5 star hotels. Tourist visiting Malaysia can Book a Kuala Lumpur Hotel Online using numerous online booking hotel websites.